À seulement 35 minutes de Perth Le chalet offre une retraite de style de vie idyllique pour les familles ou une escapade intime. Situé sur le bloc rurale avec une faune abondante et des oiseaux. Grandes promenades et seulement 15 minutes des plages primés. Visitez nos vignobles locaux, l'écrou ferme de noix de macadamia, terrains de golf, ou tout simplement flâner autour de profiter des promenades et magnifique vie des oiseaux. Construit à la main par la famille Reeson Le chalet peut accueillir six. Le gîte dispose d'un lit queen size et 4 lits superposés dans la deuxième chambre. Tout le linge y compris les serviettes sont fournis ..
Ventilateurs à des espaces de vie et d'inversion de cycle climatisation pour votre confort qui rend pour une ambiance détendue expérience de séjour à la ferme. Nous avons des chevaux. nos amis les chiens, poules, oies et aussi un cochon animaux de compagnie appelé Crackle, qui siégera pour son souper. TV avec une sélection de DVD. We really enjoyed this cute little cottage and all the animals with our children. It was a pleasant stay. We would stay again. 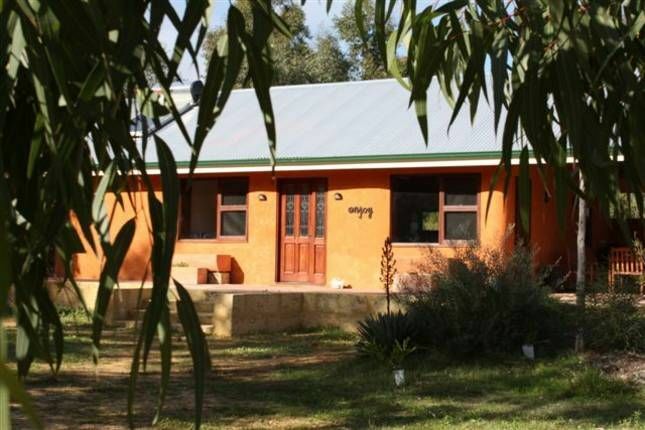 Thoroughly enjoyed our stay at the Straw Bale Cottage Baldivis. Loved the rural atmosphere whilst still being close to the city to visit family and friends. Wonderful to spend some quality time with our children in this thoroughly comfortable straw bale cottage experience. We had a great stay at the cottage. Would be happy to recommend to friends and family. Clean, comfortable and lovely quiet location. The owners have done an amazing job creating a lovely space with this straw bale cottage. We were very comfortable with two adults and 4 young children. The owners have been very environmentally friendly with this build but solar hot water system only allows for hot showers at night time. Through the photo album, we got to appreciate the owners' effort in building this cottage using basic wood, straws and clay materials. Very conveniently located from nearby Mandurah and Rockingham. We had everything we needed to have a comfortable stay. The horses were friendly and welcomed our pats!